Climate change should be obvious by now. The vast majority of scientists in the field have been certain of it for some time now, while some of us regular folks haven’t known what to think. The super storm that struck the New York City area is like an exclamation mark on the scientific statements regarding climate change. “Things are different now,” the storm seemed to be saying. This has been what scientists have been warning us will happen. It is important to use the term “climate change” and not “global warming” because the latter term can lull one into thinking if “my temperatures” are not getting hotter, then this must all be a bunch of hogwash. “Climate change” indicates a broader, more subtle phenomenon. With that stated, I never remember a Texas fall like this one. I have no idea if this weather has been a result of climate change or not, but it’s strange when you can wear a t-shirt to a Christmas parade and not even be cool. There always are some Indian Summer type days, but we have had unbelievably pleasant weather in Texas for weeks. Rising sea levels seem to be one of the biggest concerns. A great New York Times page shows what land around major U.S. cities would be “permanently flooded, without engineered protection” if the seas rise to varying levels. Galveston doesn’t fare well. 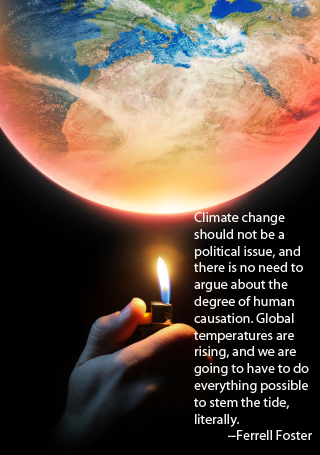 Climate change should not be a political issue, and there is no need to argue about the degree of human causation. Global temperatures are rising, and we are going to have to do everything possible to stem the tide, literally. And this is not just about protecting American cities; millions of the poorest people in the world would be displaced by rising sea levels. We will not just let them die; we will have to help them move to safety. May must be prayer month. We had the National Day of Prayer earlier, now there also is a Day of Prayer for Creation Care–Friday, May 20. The web site has helpful information. This year organizers are focusing on the impact of mercury on the unborn. “One in every six babies born in the United States are born with harmful levels of mercury in their blood,” the site says.